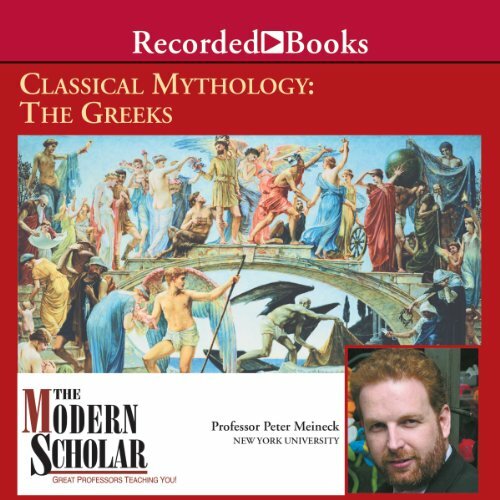 In Classical Mythology: The Greeks, widely published Professor Peter Meineck examines in thrilling detail the far-reaching influence of Greek myths on Western thought and literature. The nature of myth and its importance to ancient Greece in terms of storytelling, music, poetry, religion, cults, rituals, theatre, and literature are viewed through works ranging from Homer's Iliad and Odyssey to the writings of Sophocles and Aeschylus. Through the study of these time-honored myths, the Greek heroes and gods - including Heracles, Zeus, Achilles, Athena, Aphrodite, and others - leap from the page in all their glorious splendor. The following lectures are not only an entertaining guide to Greek mythology, but a fascinating look into the culture and time that produced these eternal tales. I think Peter Meineck does a wonderful job here of explaining Greek mythology. I can now confidently approach literature which have Greek mythological references and have a greater appreciation and understanding of its origins. There are 14 lectures where Prof. Meineck covers the major greek mythological characters. A wonderful discovery of learning if you ask me! Very, very informative with alot of perspective as to the meaning of all these Gods, with excellant reasoning. If you like mythology get this audio, if you dont like mythology get it anyway, because you soon will!! I enjoyed this course and learned a lot. Professor M has a great voice and excellent style. I'm a high school literature teacher who is teaching myths and the Odyssey. I found Meineck's lectures very interesting and helpful; I'm on my second listen now. If you know very little or nothing of myths and the Odyssey and Illiad, you would benefit from reading a bit about those before hearing the lectures. You certainly don't need an exhaustive knowledge of the stories though. If you could sum up Classical Mythology in three words, what would they be? I have always wanted to learn more about Greek mythology and its meanings then and today. This course was both easy to listen too, learn form, and enjoy. The accompanying pdf transcription download from the writers site is also an incredible resource. This was the only book I had, to listen to at the time, I know very little about mythology, and it is not on the top of my list for knowledge enhancement. I started listening to this book, with the intension of downloading another book when I could...I listened to the whole thing and found I was interested in learning more. I enjoyed every minute of this course and will listen again. Meineck is a superb guide to Greek mythology. His enthusiasm for his subject is contagious! Professor Meineck is a captivating speaker and this was a great course. It makes me want to go to Greece!